Takamine acoustic guitars are in a category of their own. While they might not be the most refined or best looking things out there, they’re reliable and consistent. 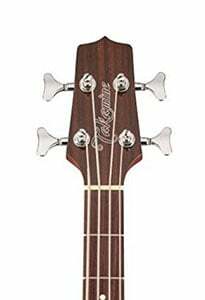 Takamine GB30CE is therefore among the most impressive acoustic bass guitars you can find at the moment, and for a good reason. On a first glance, Takamine GB30CE looks fairly basic. We have what appears to be a concert body shape with a single cutaway. Takamine went with the proven solid spruce top combined with solid mahogany back and sides. That choice of tonewood can rarely yield bad results. Neck is pretty smooth and very playable. Usually with acoustic bass guitars you tend to see somewhat raw neck profiles, but Takamine sure ironed out their design for GB30CE. Despite its apparent simplicity, the closer you get to the surface of this bass, more details are revealed. The thing that got us the most is the level of craftsmanship that went into CB30CE. Everything fits in so elegantly, almost seamlessly.Then again, we expected nothing less from Takamine. When it comes to the build quality, fit and finish, CB30CE proves why Takamine is an authority in this industry. Our praise continues as we move onto hardware. The headstock houses a set of die cast chrome tuners that aren’t necessarily all that special. However, they are miles ahead of what you will usually see in this segment and the segment below. Precision, fine adjustment and key retention are among the things you can count on with this set. On the other end of the business, Takamine went with pure Indian rosewood. Saddle arrives setup from the factory and generally requires no additional adjustments. That is just another one of those things that Takamine is known for. 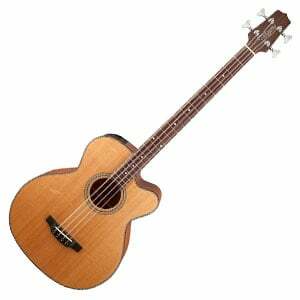 Since this is an acoustic electric model, you also have Takamine’s TK­40B preamp along with their transducer pickup. Controls available include a three band EQ as well as gain knob, mid shift and bass boost.It is easily among the more capable systems you can find in this segment of the market. Mere workhorse reputation isn’t enough to make an acoustic bass great. It has to offer performance that’s worthy of that title. Fortunately for us, Takamine GB30CE not only meets the expectations, but goes pretty far beyond them. Its conservative body shape yields massive lows but also fairly balanced mids. Despite its somewhat thin waist, there is a lot of acoustic real estate to work with here. On top of that, trebles come out natural and clear. Plugged in, this bass guitar expands the possibilities quite immensely. On board EQ allows for a lot of tone shaping, although you can always tap into the source tone profile by using the available EQ bypass. The best thing about a setup such as this one is that you are not that reliant on additional preamps or pedals to bring your tone where you need it to be. Takamine has once again proven why they are simply one of the best. GB30CE offers a great balance of practical style, reliable build quality and refined performance. 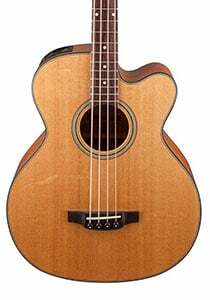 Those looking for a proper workhorse acoustic bass can rest assured that GB30CE is good choice no matter what you need it for. For more info about the Takamine GB30CE, click here.